It’s been a while since I posted. Part of the reason is because I started a new job, and other daily constraints have limited my time for hobby work. As such, time I would normally allot for posting has gone down. I’ve also had a couple other semi-hobby-related that have had my attention for the past two months (I’ll write about them in another post). Add to that the miserable rainy weather we’ve had in my neck of the woods, which means its to humid for priming. All that aside, I have finally completed my last Black Legion obliterator. 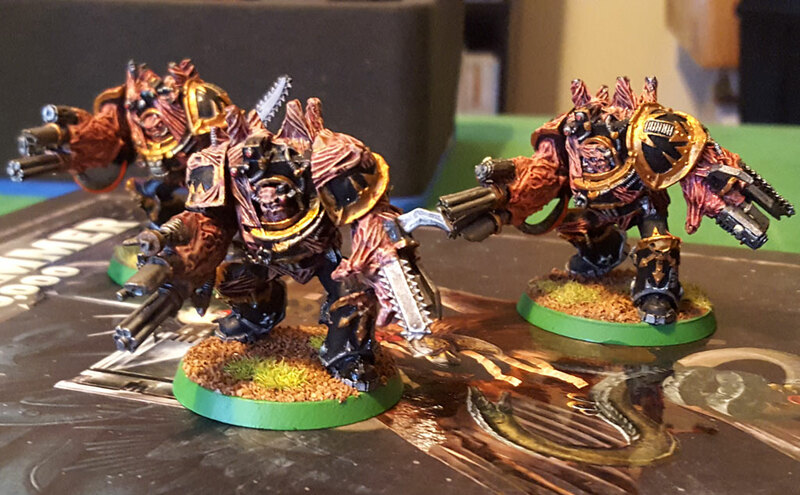 I used the same scheme (or at least fairly similar) for most of the model as I did for the two other obliterator models I have. My pot of Shining Gold is still liquid and usable, and I have close approximations of Boltgun Metal and Chainmail paints. The only formula I altered was the fleshy parts. I’ve been doing a little bit of hobby work in fits and starts over the summer. I was able to finish my vow for ETL over at the Bolter and Chainsword (more about that later) and I put together a bunch of models, mainly from my old Dark Vengeance box sets. 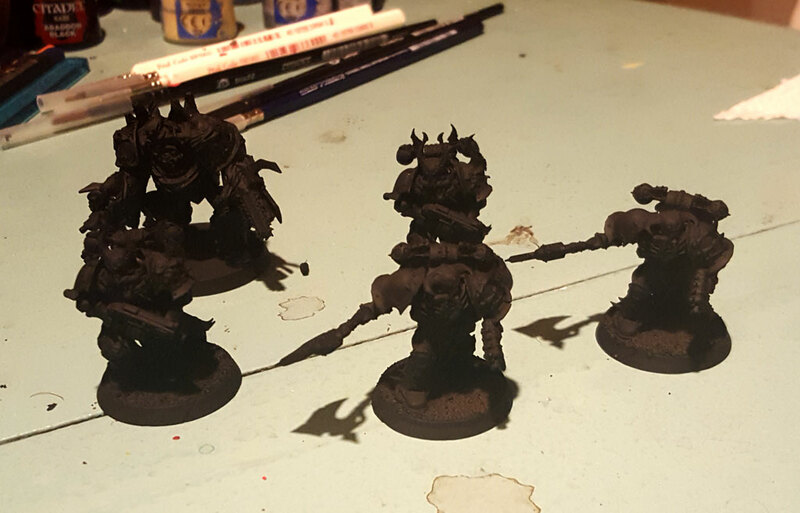 Of those models, I’m getting ready to paint up some of the Chosen in Black Legion colors to use as Aspiring Champions. I still really like the look of these models even though they are a few years old. My only gripe is that they are in a static pose. I think Games Workshop really missed an opportunity to make a nice multi-part box set with them. I realize Chosen are not popular in armies, but plenty of people like me use them as Aspiring Champions for Chaos Space Marine units. Heck, I could imagine the more ambitious among us would be using them as standard Chaos Space Marines. The month of July really flew by. While my hobby time was not as consistent as I’d have liked, I did make some progress on a few fronts. I’d been doing quite a bit of painting and I think I got a little burned out. Also, looking at the boxes on my shelves made me realize I’ve got a lot of stuff in the backlog. So I decided to build some stuff. I’d ordered a couple of the Shrine of the Aquila kits since it looked like a bunch of Games Workshop’s old 40k terrain was getting mothballed. This was a kit I’d not gotten before so I was looking forward to building it. 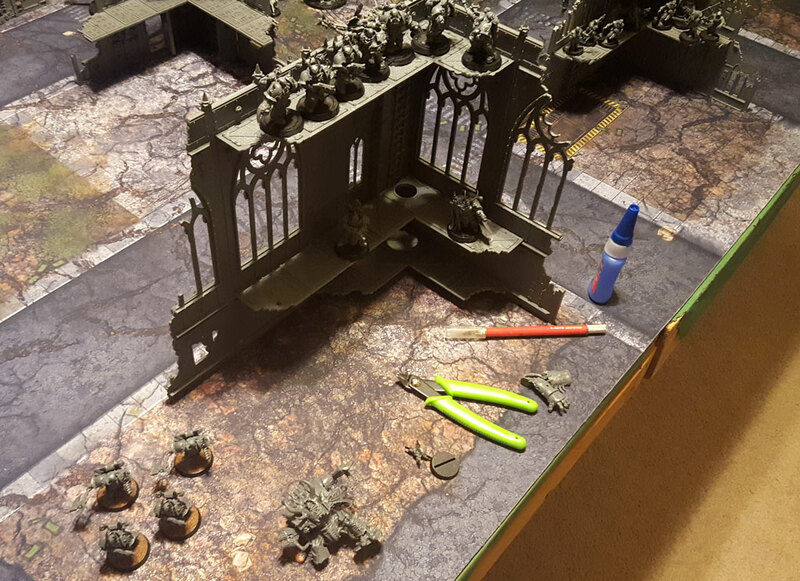 The Shrine is a bit of a different kit from the other Sector Imperialis kits in that you really don’t have a lot of freedom to build the kit in a bunch of different ways. There might be a couple of slight variations you can perform, but you aren’t getting two or three small buildings out of the kit like you could do with, say, the Basilica Administratum. It really is just one giant building. 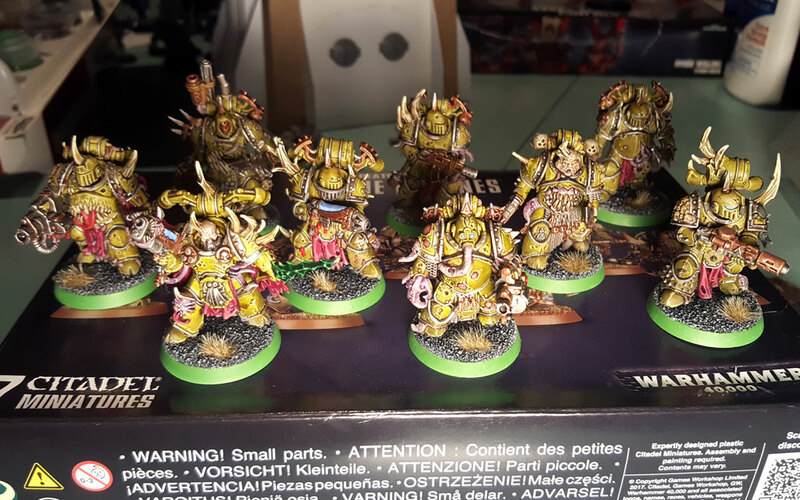 I had a nice block of hobby time available the other day, so I was able to finish up my second group of Plague Marines. The basing and varnishing went pretty smoothly and they are now ready for the tabletop. This will give me a plasma gun group and a blight launcher group. I’ll need to get another box of Plague Marines to finish out my third squad with melta guns. That said, I’m pleased with how these guys turned out, and I think I learned a couple things from the Dark Imperium squad. I don’t do enough posts on Wednesday about what I’m working on. I’m hoping to change that. 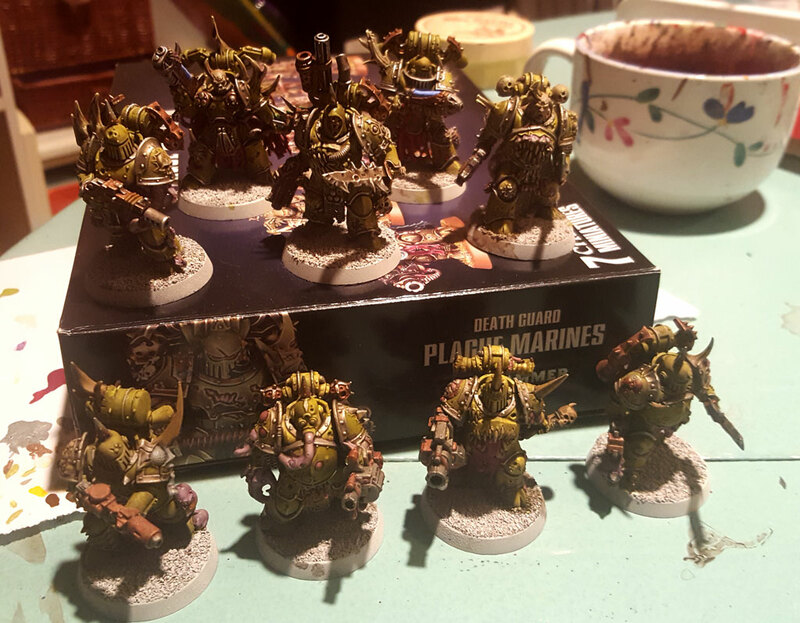 So here is a quick update on my Plague Marines. I’ve gotten just over half of them through the highlighting stage. That leaves four left. I’m pretty pleased with how they are progressing. I apologize for the bad lighting in these photos. I did the champions first as I knew they would have the most diverse color palette. They also probably have the most detail. I knew I would invariably miss details as I tried to paint them in production line fashion. That gets to be time-consuming. So I figured I’d paint the most time-consuming models first to avoid any chance of fatigue or burn-out or whatever. It’s worked well so far!